Realized between 1754 and 1766 by Matteo Pirona, the Canal Grande was a key element of the new urban plan that led to the construction of Borgo Teresiano. Present-day Borgo Teresiano (from Corso Italia to Piazza della Libertà) was once an area of salt marshes, now completely reclaimed. The channels perpendicular to the seafront were surveyed extensively and plans were made to excavate them in order to expand the navigable area of the city and allow easy loading / unloading of goods at canal-side warehouses, but the project was later abandoned and the Canal Grande remained the city's only canal. Later, in 1934, the final part of the canal was filled with waste material from demolition work in the Jewish ghetto and the old city. There is even a small torpedo boat lying on the canal bed. 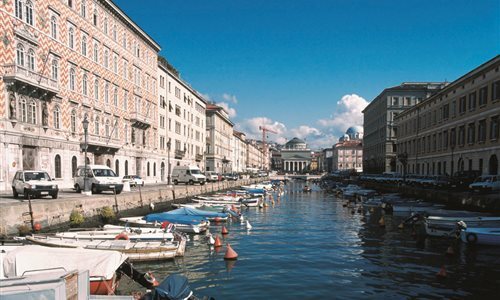 The canal was one of the nerve centres of Trieste's commercial hub. Its banks are still lined with the squares, churches and historic cafés built by the merchants who made the city great: Palazzo Gopcevich, now the home of the Schmidl Museum Theatre and the Photo Library of the Civic Museums, Palazzo Carciotti, Piazza Ponterosso, Piazza Sant'Antonio, built on the in-filled canal section in 1934, the Serbian Orthodox Church of San Spiridone, the Church of Sant'Antonio Taumaturgo, and the historic Stella Polare café. The canal was originally crossed by three bridges (Ponte Bianco, Ponte Rosso and Ponte Verde), which used to swing open to allow boats to enter. Only the Ponte Rosso (Red Bridge) remains. Recently a pedestrian footbridge, Passaggio Joyce, was created, and is now known in the city as the Ponte Curto (Short Bridge) after an alleged error in the measurement of the canal's width, which was commemorated with a mock tug of war to pull the canal banks closer. A statue of James Joyce (created by the Trieste sculptor Nino Spagnoli on the centenary of Joyce's arrival in Trieste) was erected on the Ponte Rosso in 2004, and the Berlitz School founded by the Irish writer stands in Piazza Ponterosso itself. Another item of interest can be found in the corner of the dock beneath the Ponte Rosso, where a careful look reveals a tide gauge carved in stone and calibrated in Parisian feet and inches. The zero of this tide gauge is known in the scientific world as the Zero Ponte Rosso. Traditional Christmas markets and various other events such as the Barcolana regatta are now held along the canal and in Piazza Sant'Antonio.